The Minnesota Vikings played their most complete football game of the year Week 11 vs. the Seattle Seahawks. The game featured 4 different receivers catching touchdowns, a solid two headed running attack, and a defense that didn't allow the Seahawks any breathing room. Although the Vikings did not score any points in the first quarter I would like to credit the Seahawks defense for a job well done on the Vikings potent offense. Mix in some Viking penalties and you have your answer for the scoreless first quarter. When it came to the second quarter the Seahawks weak defense could not hold on anymore by allowing the Vikings to march down the field and score on a drive that started on their own 16 yard line. The Vikings poured on the points with Favre's precision passing hitting all his different dangerous down field weapons. Couple that with a punishing running attack that did not only come from Adrian Peterson, but also Chester Taylor. The Vikings did not let an inferior football team hang around long enough to even sniff a victory. Many times against weaker teams the Vikings have played with their prey before finishing them off; but that was not the case against the Seahawks. The Vikings got on the board and never looked back. Forget the first quarter hiccup. Minnesota put the pedal to the metal and played like the best team in the NFL should. That's right, I said it. The Minnesota Vikings are the most COMPLETE team in the NFL and that makes them the BEST team in the NFL. The Vikings score the ball anyway they want on offense, have a dangerous special teams unit, and have a defense that stacks up with the best in the league. No other team in the NFL can get it done in every category like the Vikings can. #1 The most important thing from this football game was Brett Favre playing like a god. He threw for 213 passing yards by going 22/25. That is the highest completion percentage of his career and the highest in Vikings history. Oh yea, he also threw 4 touchdown passes. It is truly difficult to imagine Favre after all the accomplishments in his career and being virtually the possessor of every single quarterback record in the NFL still breaking records as a 40 year old. Believe it or not Favre actually has better numbers through Week 11 this year than he did through Week 11 when he won all three of his MVP Awards. Higher completion percentage, more touchdowns, less interceptions...as a 40 year old. Favre is definitely in the running for a 4th MVP Award with how he stacks up to the leagues best passers this year. Even though a player besides a quarterback can win it, a quarterback probably will win it this year. Unless Chris Johnson stays on his pace and the Titans rally off 10 straight wins after starting 0-6. Favre has more than 600 fewer passing yards than Peyton Manning and Tom Brady who are atop that coveted passing yards list. But you have to expect Manning to get all those passing yards considering Indianapolis rushes for the second fewest yards per game in the NFL averaging a mere 85 yards. Favre has one less touchdown than the leagues leaders (Brees, Rodgers) with 21 total. He has a 69.7 completion percentage which is only a tenth behind the league leader Peyton Manning. With Favre being in the top tier of all those passing categories, can you guess where the all time interceptions leader in the NFL stands this season in that very category? NUMBER ONE (minus Shaun Hill who has only attempted 155 passes). 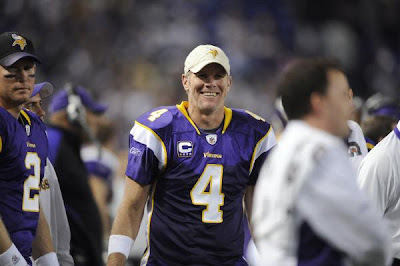 Who would have thought gunslinger Favre would have the fewest interceptions in the entire NFL through 11 weeks? Not I. Even precious Peyton and Drew Brees have 9 interceptions this season. When all is said and done, if Favre plays out the season like this his name should be a major player in the MVP discussion. #2 What a dominating game by the Minnesota defense. The best stat a fan can pull from their performance is holding the Seahawks to only 4 rushing yards the entire game. With this overwhelming performance the Vikings are now 3rd on the defensive rushing list only giving up 85.5 yards a game. Once Seattle realized they wouldn't be rushing the football (they only had 13 attempts) they went to the air where they still could not find a whole lot of success. Nate Burelson had a nice game, but he only racked up yards. No passing touchdowns from the Seahawks. Seattle was 1-10 on 3rd down conversions which is always important in the NFL. The defense also forced and recovered a fumble and rookie Asher Allen got his first career interception. A little cause for concern is the two sacks hauled in by Linebacker E.J. Henderson and Safety Husain Abdullah. The Vikings do not blitz too often and that was the only way Hasselback was sacked the entire day. No sacks by the D line. Jared Allen had 3 Quarterback hits, but the team only had 5 total. 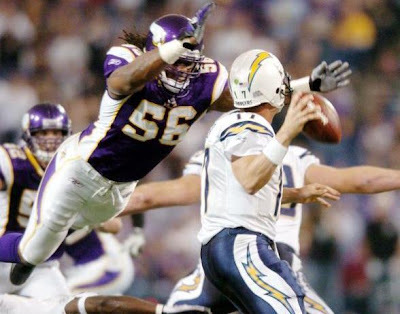 (2 of those equal sacks) Not the pressure Vikings fans are used to. #3 It was nice to see Chester Taylor get into the rushing attack with AP. Even though neither back finished with over 100 yards they both were inflicting damage on the Seattle defense with their carries. Especially Taylor who only had 11 carries but netted 73 rushing yards. It was also nice to see AP catching more passes out of the backfield (he grabbed 4). Both backs were productive and that is more than a good sign heading down the stretch of this season. 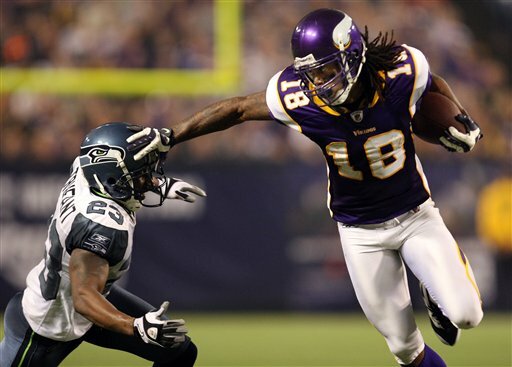 #4 Can I even stress enough how awesome Sidney Rice is. This past week he just locked his Pro Bowl spot by catching 2 touchdown passes to give him 4 total on the season. That was the only stat he was lacking in receiving, and 4 puts him in the middle of the pack. He is already 4th in the NFL in receiving yards, and is 3rd in the NFL with catches over 40 yards. The only thing Sidney didn't do this week was have 200 receiving yards, but he made up for it with 2 touchdowns. The second touchdown he caught from T-Jack was a fine example of a player making a huge play. #5 If one thing seems to remain consistent from week to week it is that Visante Shiancoe catches a touchdown pass, and this week was no different. His 7 receiving touchdowns this season are towards the top of the league and second best among Tight Ends (Vernon Davis has 8 touchdowns). Shiancoe was especially valuable in this game catching 8 passes and playing the role of Favre's go to guy in tight situations. Shiancoe works extra hard every week staying after practice catching passes from different angles and speeds. His hard work has payed off. #6 The Vikings secondary continues to play well in the absence of Antoine Winfield. Despite allowing decent passing numbers from the Seahawks, something has got to give when a team throws it more than two thirds of the time. The secondary is needed to continue playing well even with the addition of Winfield to the unit in coming weeks. Upcoming on the schedule are the dynamite passing attacks of the Bengals and Cardinals. And you can never count out a man like the Panthers Steve Smith who can destroy a defense by himself. 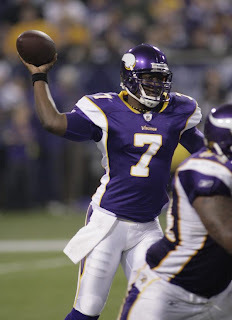 #7 Haters can hate, but you cannot deny Tarvaris Jackson looking good when he stepped in late in the game. Say what you want about the team we were playing, or the score, but the kid stepped in a got it done. His passes looked accurate with some zip on them. He still looked a little indecisive, but I think Favre's influence has helped him go through his reads better. Jackson finished 6/8 with 77 pass yards and a touchdown. That is an average of 9.6 yards per pass. This play is just as efficient as Favre. If you are going to give Favre the credit for playing well against a bad team the same needs to be given to Jackson. I always like to see him have success. Which teams are pretenders and which teams are contenders? The red hot Cincinnati Bengals cooled off in Oakland as the Raiders toppled to AFC North Division leaders. The Bengals called a conservative game once they had the lead which ended up burning them in the end. They allowed 10 fourth quarter points while scoring none. Idiot of the Week is the Bengals Andre Caldwell who fumbled the football on a kickoff with :33 second left on the clock in a tie football game. The Raiders used that fumble to kick the game winning field goal. 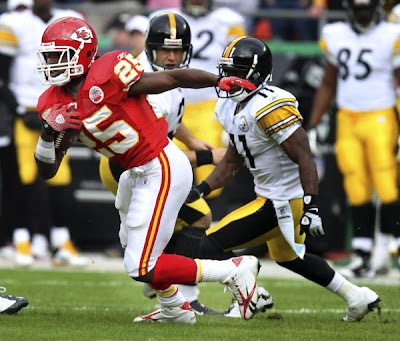 The Steelers losing to the lowly Chiefs has to be the upset of the week. With how well the Steelers have been playing it is a shocker to see them lose to the 3-7 Chiefs. Not a surprising loss when you consider the Steelers had 3 turnovers and gave up a kickoff return touchdown. This is a perfect example of any team in the NFL having the ability to win no matter the opponent. The Broncos are pretenders (even though they beat the Giants on Thanksgiving, but anyone can beat the Giants these days). 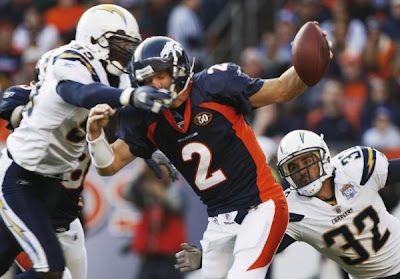 The Broncos didn't even show up for a game of utmost importance against the charging Chargers (pun intended). The Chargers demolished the Broncos 32-3 to take the AFC West Division lead. My biggest question is why even start crappy Chris Simms to destroy any momentum in the game and just start Orton. Once Broncos coach Josh McDaniels realized like the rest of us the Chris Simms is a joke in a NFL jersey he put in Orton who facilitated some offensive success. That isn't the only mistake McDaniels made as a coach this past Sunday. He foolishly tried an onside kick only to be recovered by the Chargers who took that field position and easily scored. The Broncos are not for real. The division is the Chargers and Denver is not near good enough to win the Wild Card. Very quietly the Jacksonville Jaguars are 6-4. After staring 0-2 it seemed everyone in the NFL counted them out. Now they have rallied off 3 straight victories. Their upcoming schedule will display their true colors as they face off against the Colts again, the Texans, the Patriots, the 49ers, and the Dolphins. That is a tough 5 game stretch. If this team is a force, victories in those games will prove it. Lastly I want to take my hat off to Vince Young and the Tennessee Titans. After staring 0-6 the Titans needed to shake things up. Enter the talented but doubted Vince Young. Not only has this kid played efficiently to win football games but has played great down the stretch to get his team needed yards for first downs making crucial passes and using his legs to rush the ball. I am sure many NFL fans like me are rooting for a nice comeback for this team. With a back like Chris Johnson on your team you can never count the Titans out.